Phoenixville, PA is much like Collingswood, NJ, a rejuvenated town brought to life by a preponderance of good BYOB restaurants. The difference between the two may be that Phoenixville adds in quite a few bars amidst the eateries giving the town a little more lively feel on the weekends. My wife and I, and our friends Gerry and JoAnn, had tickets to see Two Funny Philly Guys (Joe Conklin/Big Daddy Graham) at the Colonial Theatre in Phoenixville last night. We had decided on Daddy Mims for dinner and I was looking forward to some good Cajun cooking. We were not disappointed. 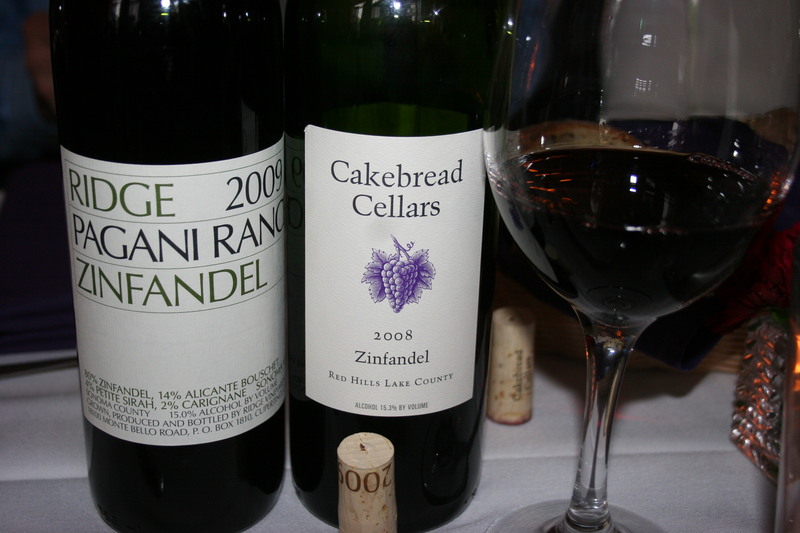 Matching wines with Cajun food can be tricky but both of us settled on zinfandels. I brought the 2009 Ridge, Pagani Ranch, Zinfandel. This one scored 92 points from the Wine Spectator and had a nice nose of leather and blueberry . a smooth mouthfeel with intense red and black berries and a hint os pepper and spice. Gerry had a 2008 Cakebread, Red Hills Lake County, Zinfandel. This one was from an area north of Napa and the dark fruits and flinty vanilla proved a good match for the spicy food we were sharing. Daddy Mims is a family affair while John Mims the Chef/Owner works his magic in the kitchen both his wife and step/daughter, Heather, are out front providing great service while evidencing total knowledge of the menu and displaying a terrific attitude. Heather opened our wines while going over the various menu options, and there are quite a few. There is a prix fix Cajun menu, a Chef’s Tasting Menu and a special Lobster menu. We considered all three of them but ended up making our choices from the regular menu which offers more than enough choices to make things difficult. Kathy and I began by splitting my personal favorite salad, The Wedge. 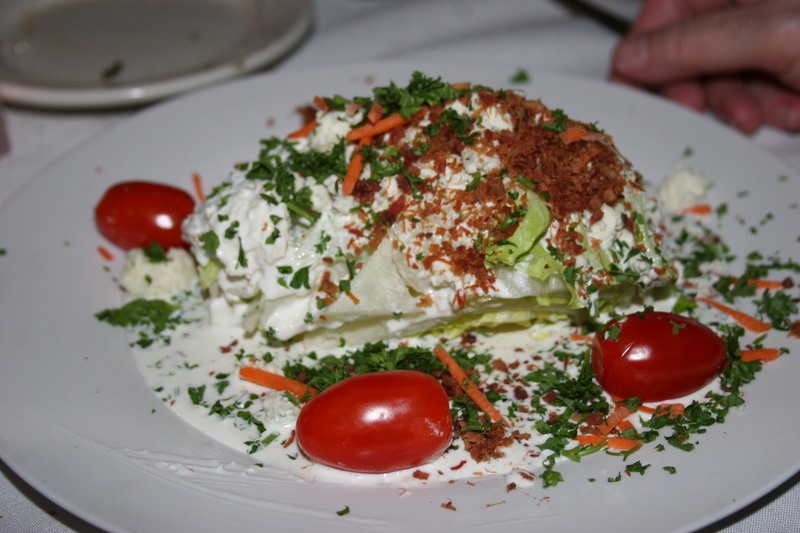 One half of a head of fresh lettuce with bacon, tomatoes and lots of rich blue cheese dressing always make this a perfect starter to any meal. It may have been the only food item that was not clearly creole. Each of us chose a different appetizer. Mine was the Chicken and Andouille Gumbo. 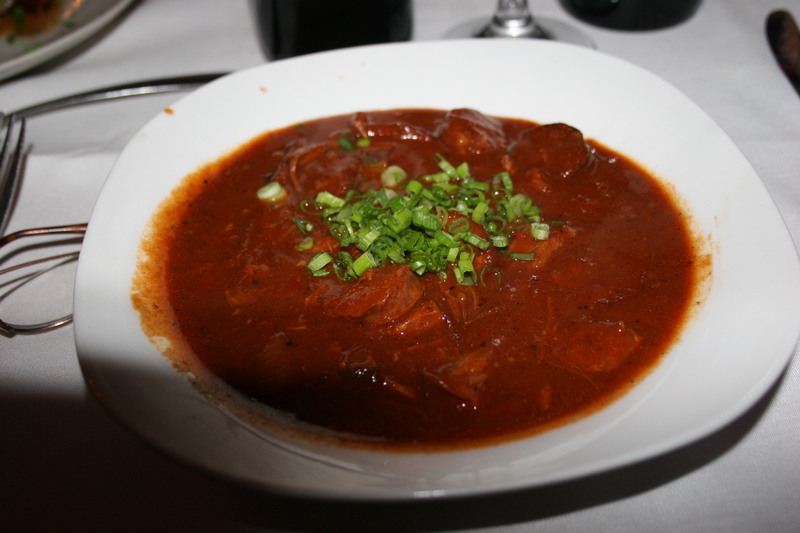 Nice pieces of chicken and lots of andouille sausage in a classic New Orleans gumbo that had just the right amount of peppery spices to put the taste buds on full alert. My wife, Kathy, had her heart set on the mussels which she had spotted on the website menu. On this particular night they were substituting clams for the mussels. 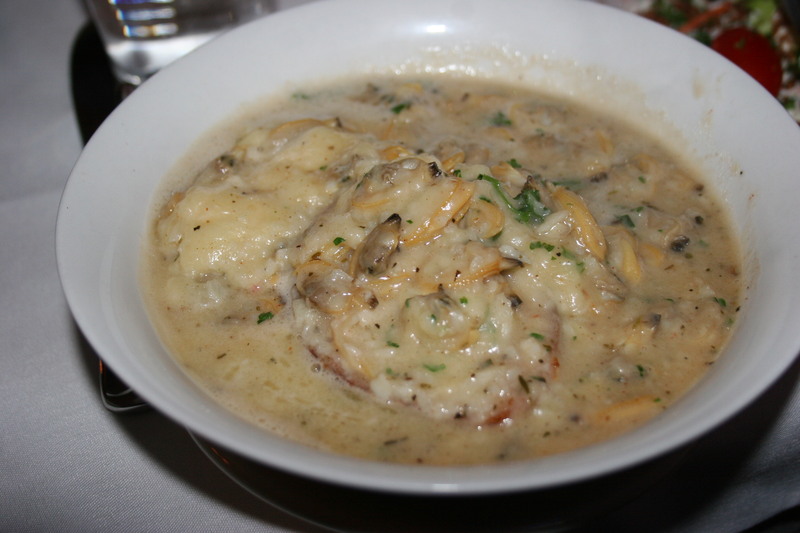 She was going to switch to something else but Heather explained that the clams were served out of the shell and in the same sauce (a white wine, Asiago and garlic butter concoction) that housed the mussels. Based on her recommendation, Kathy went with the Clams and thought they were very good. 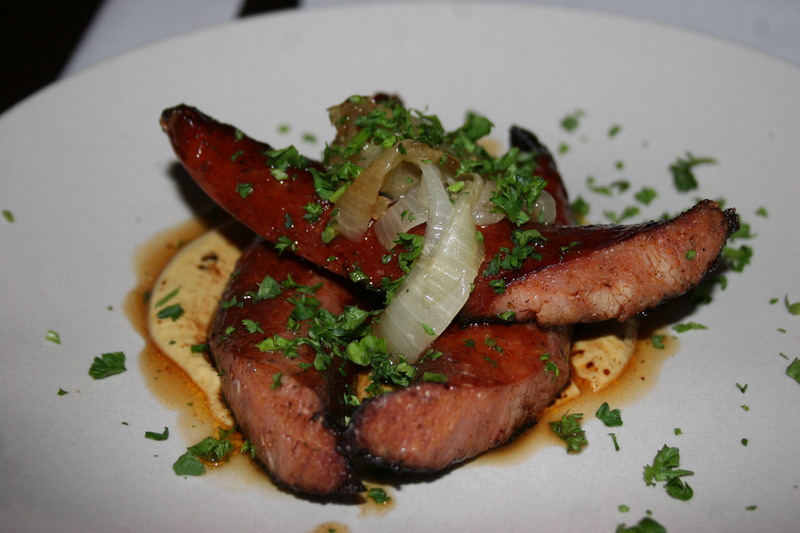 Meanwhile, on the other side of the table, Gerry was totally enjoying, not just both of the zinfandels but, his appetizer selection of Grilled Andouille Sausage topped with carmelized onions and mustard; another typical Louisiana dish that Chef Mims has mastered. JoAnn liked her appetizer every bit as much as the rest of us liked ours. 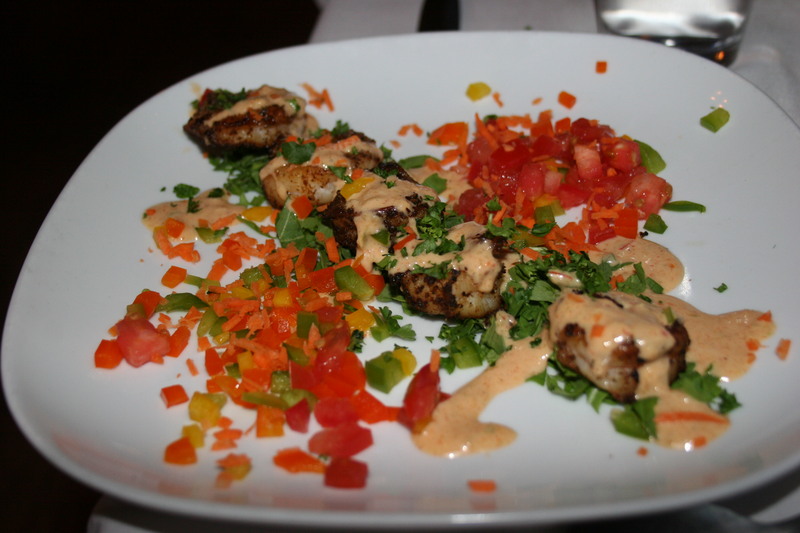 She went with the Blackened Shrimp Remoulade served with a Cajun tartar sauce. There was a nice pace to the meal as we watched the dining room quickly fill early on this saturday evening. 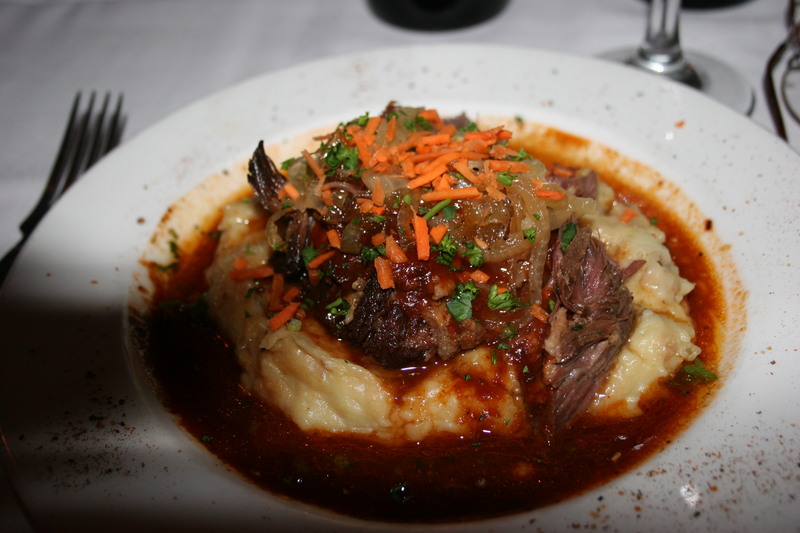 For my entree, I went with the Braised Beef Short Ribs topped with Port Wine demi-glace and served over cheesy fondue mashed potatoes. This dish tasted every bit as good as it looked. I sometimes find that as tempting as the short ribs always sound and you know the meat is going to be tender, they sometimes lack a lot of taste. This was NOT the case with these ribs as they were full of flavor while the potatoes were the perfect partner and the demi-glace was excellent. Kathy wasn’t 100% sure her stomach could tolerate a whole lot of Cajun spice so she was delighted to see that the menu offered a couple of choices that weren’t totally creole flavored. 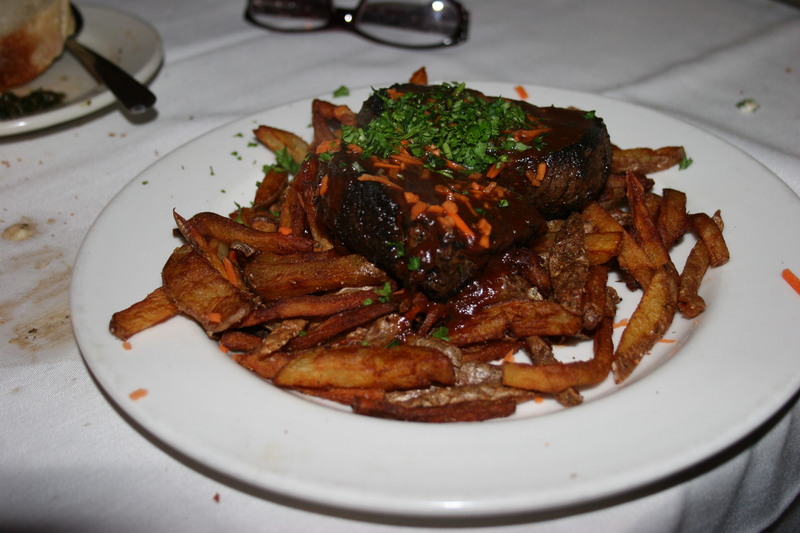 She chose the Chef’s Cut Filet served over truffle fries. Her medium steak may have been slightly closer to medium-well but she had no real complaints and enjoyed her dinner enough to bring home a good portion that may serve as tonight’s meal. I will have to settle as an observer as I had nothing left from my entree to wrap up and take home. 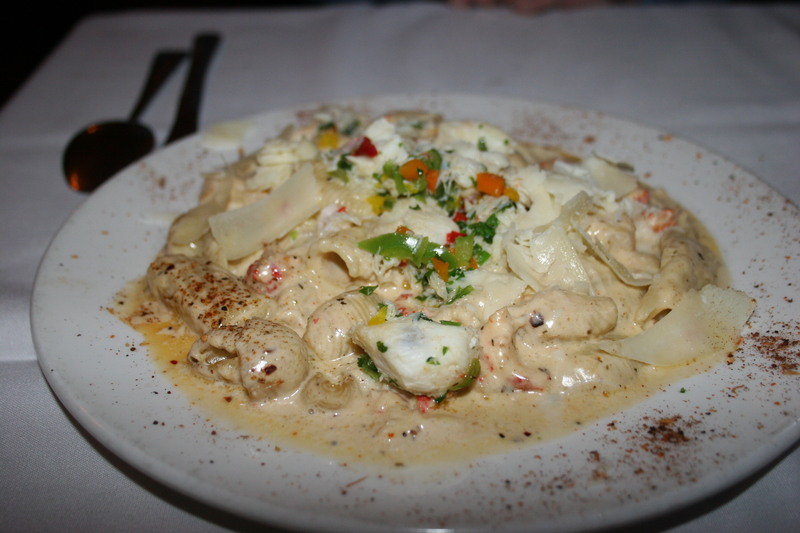 Gerry had the Cajun Seafood Pasta, shrimp, crabmeat and crawfish served over pasta in a rich Cajun cream sauce. This one was chock full of seafood and it wasn’t long before his plate was clean. 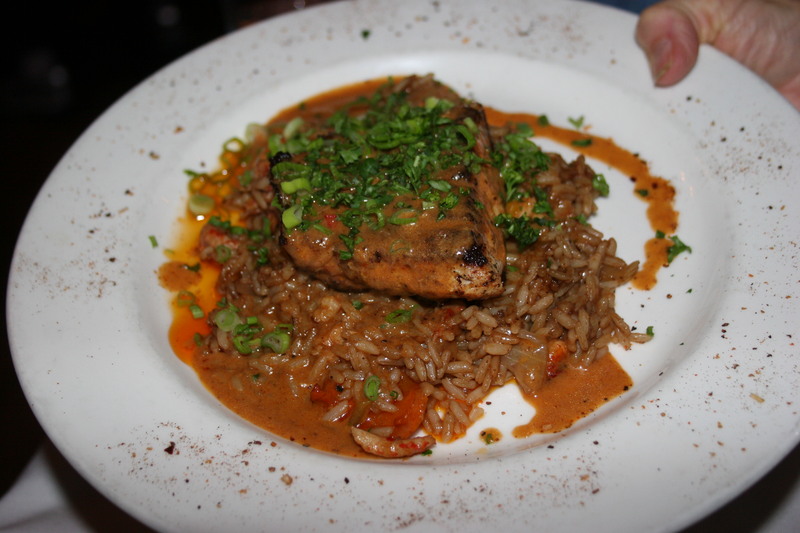 JoAnn probably went more New Orleans than any of us with her entree selection of Louisiana Red Fish with Crawfish Etouffe served over Jambalaya. She thought her dinner was outstanding. We still had a little room for dessert and I had asked Heather prior to our meal while trying to decide which menu to choose from, if we could order the Coconut White Chocolate Cake which was only on one of the special tasting menu and not a part of the regula dessert menu. She said that we could, so each of the couples had a piece to share with one another. The cake was good but I thought the portion was much too small. It wasn’t until today that my wife suggested that may have been since it was part of a tasting menu and not an actual menu selection. Whatever, it’s the only small blemish on what was a terrific meal with great service by the entire staff. Our water glasses were filled constantly and our silverware changed more than once. 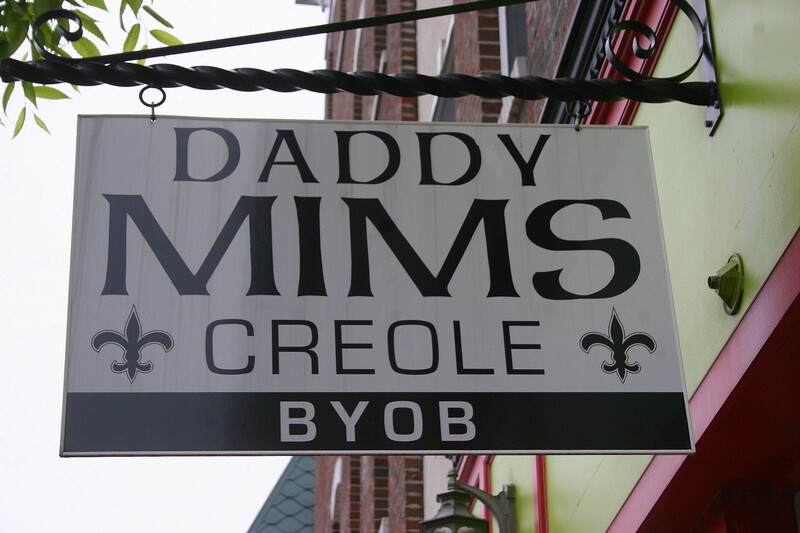 Daddy Mims Creole BYOB is a great choice for dinner in the Phoenixville area. By the way, if you have never seen Joe Conklin in a live performance, it is truly a treat.